Siskiyous to the Wallowas, Oregon has a landscape as diverse as it is beautiful. And there is no better way to see it, to live it, than with a good pair of boots and gun or bow in hand. In Hunting Oregon, the authors (Gary Lewis, Scott Haugen and Duane Dungannon) take you afield to hunt Roosevelt and Rocky Mountain elk, blacktail deer, mule deer, Columbia whitetails, bighorn sheep and more. Follow along on hunts for chukar, pheasant and wild turkey. Discover when and where to hunt in Oregon, to detect patterns in travel and behavior and learn how game animals use cover. Learn how to plan the hunt, to take trophy animals, to turn the harvest into delicious and nutritious meals and prepare your prize for taxidermy. Hunting Oregon covers waterfowl, upland birds, small game, predators and big game in the Beaver State. It is also about a way of life, a passion shared by men and women, a passion to pass to the next generation. And it is the celebration of the chase and the solitary challenge, the time spent with friends or family around the campfire. 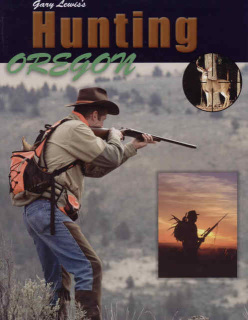 This is book is written by Oregon hunters for Oregon hunters and will be appreciated by all hunters.